Errol Boyle is a seasoned manager and executive with over 45 years of experience in the energy, pipeline, and marine transportation related industries. Over a career spanning a variety of geographic locations and major industry entities, Boyle has honed the technical skills, innovative planning and administrative expertise necessary to plan and execute highly complex projects. Boyle began his professional career as an engineer at Mobil Pipeline Company, working for Mobil in locations as varied as California, Alaska, New York and London. He next worked for Western Crude Oil, Inc. in London and Denver, CO, before moving to Koch Industries, where he held the position of President, Koch Shipping, Inc. and President of Cayman Bunkering Company. Boyle subsequently held executive management positions at All American Pipeline Company, Inc. and Cajon Pipeline Company, Inc., in Kansas and California, respectively. He founded Pilgrim Pipeline Company, LLC, as President in 2003. Boyle earned a B.S. in Mechanical Engineering from Oregon State University. He earned an Honorable Discharge from the United States Coast Guard Academy in New London, CT.
George Bochis is a seasoned manager and lawyer with over 20 years of successful project management experience. He has a track record of driving multimillion-dollar profit and portfolio value growth through strategic planning and business development solutions, and is a seasoned general counsel with expertise in leadership and management systems. For the past seven years, Bochis has been Chief Operating Officer and General Counsel for a private equity company where he is responsible for the finance, development, and management of a diverse array of ongoing projects in the oil field service sector, commercial retail space, marina facilities, office complexes and other sectors. In this capacity, he has successfully negotiated deals in a variety of domestic and international venues. Previously, Bochis was Senior Vice President of Development and General Counsel at the Maxwell Companies, a Florida-based real-estate investment trust. During his tenure, Bochis was responsible for performing or supervising all tasks in the development, construction, and property management process, and was instrumental in building the company’s real estate portfolio from a $27M base value in 1993 to $700M in value in 2007. From 2004 to 2009, Bochis served as an Advisory Board member for the Odyssey Real Estate Investment Trust. He is also a founding shareholder of Center State Bank Corporation in Florida. Bochis holds a J.D. from Stetson University College of Law and a B.A. in Economics and Philosophy from Eckerd College, and is a member of the National Honor Society for Economists. He is also a Board Member of Winter Haven (FL) Youth and Family Services and has served as the Fundraising Chair for the Inner City Olympic Foundation in Orlando. As Vice President of Financial Affairs, Bryan Greiner directs Pilgrim Pipeline Holdings infrastructure and energy investments within supply chain deficient markets. Greiner’s emphasis is within energy markets in the Northeastern United States. Greiner has raised over a billion dollars of equity and long term debt, for the construction of gas, crude oil, and refined products projects within the upstream midstream space. Greiner has also worked on projects in the Caribbean and the Middle East. Greiner presently sits on the advisory board for two publicly traded infrastructure companies. 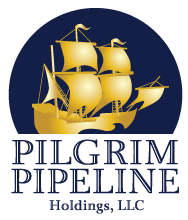 Before becoming a founding partner of Pilgrim Pipeline Holdings, Greiner served as Chief Executive Officer of Energy Infrastructure Holdings, an infrastructure development company specializing in water infrastructure, photovoltaic solar utilities, and merchant transmission lines. Greiner’s unquenchable thirst for entrepreneurial and financial innovation has given rise to a multitude of high profile projects. Greiner’s capabilities span research, due diligence, transaction execution, asset management and portfolio construction. Bill Wince is responsible for the commercial efforts of Pilgrim Pipeline. Wince is a seasoned energy industry veteran with over 30 years of experience in energy marketing. Previously, Wince held a variety of management positions at Chesapeake Energy Corporation involving business development, gas and NGL transportation, and contract administration. He most recently worked as Vice President – Business Development for Chesapeake Energy Marketing, Inc., where he oversaw the company’s development of new gas markets, including NGL’s, LNG export, power and industrial projects. Prior to joining Chesapeake, Wince held a variety of marketing management positions with Devon Energy Corporation and served as controller of Hurricane Trading Company, an oil marketing company based in Oklahoma. Wince is a certified public accountant and holds a bachelor’s degree in business administration in accounting from the University of Oklahoma. He is a member of the Society of Gas Lighting.